Most existing consumer content is based on the sRGB / Rec.709 Color Gamut Standard, including all 2K Full HD TV content. Figure 2a below shows 41 Reference Colors for the Standard sRGB / Rec.709 Color Gamut as White, Gray, and Black circles. The 10 Black circles on the outer triangle are the 100% fully Saturated Colors on the periphery. The 3 inner sets of Gray triangles are the 25%, 50% and 75% Saturated Colors between the inner White Point and the 100% Saturated Colors on the periphery. The White circle is the White Point with 0% Color Saturation. The colors in Figure 2a have been accurately calculated to show the real colors within the sRGB / Rec.709 Gamut - the colors shown in most published Color Gamuts are wildly incorrect. There is a similar set of 41 Reference Colors for the DCI-P3 Color Gamut to those shown for sRGB / Rec.709 in Figure 2a. For an in-depth discussion and analysis of these Color Gamuts see this article. 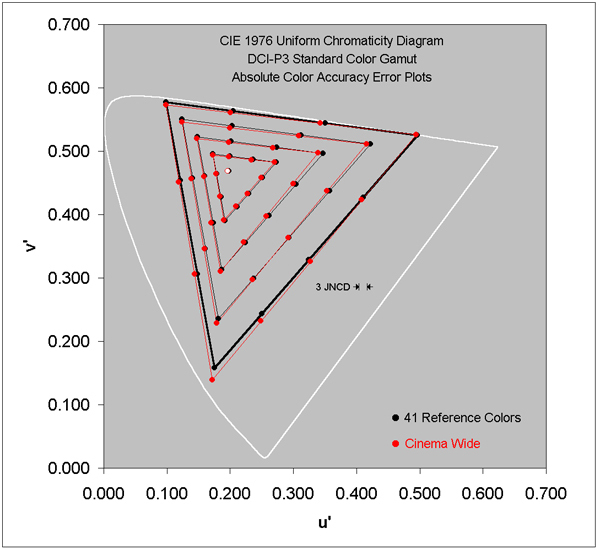 All color measurements are plotted on 1976 CIE Uniform Color Diagrams. Note that the older 1931 CIE Diagrams that are published by many reviewers are highly non-uniform and are meaningless for Color Accuracy. Also the often referenced NTSC Color Gamut is from 1953 and has been obsolete for over 30 years so stop referencing it! Cinema Normal Picture Mode: Figure 2b below shows the measured on-screen colors for the sRGB / Rec.709 Reference Colors. 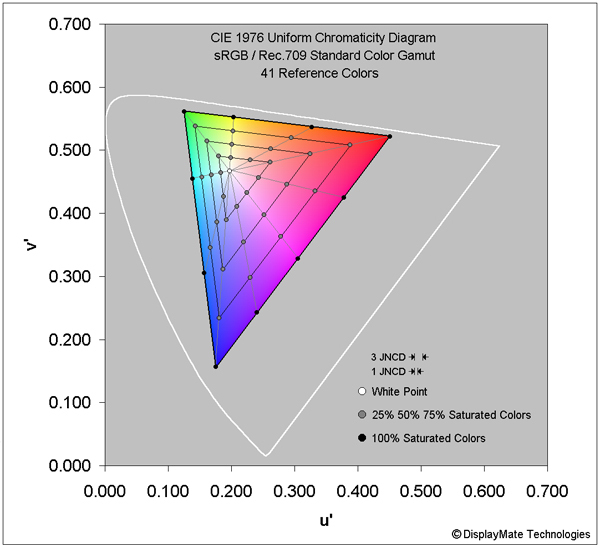 Cinema Wide Picture Mode: Figure 2c below shows the measured on-screen colors for the DCI-P3 Reference Colors. The sRGB / Rec.709 and DCI-P3 Reference Colors in Figures 2b-2c are all shown as Black circles and the measured Colors for each of the Picture Modes are shown as Red circles. Color Errors smaller than the appropriate JNCD are not visually noticeable. The 1 JNCD and 3 JNCD Errors are discussed next and are shown in the Figures below. Color differences less than 1 JNCD are visually indistinguishable, while values greater than 1 JNCD are visually noticeable when the two colors are touching on-screen. When the colors are not touching and are further apart, the visual threshold for Just Noticing a Color Difference is higher. Here we will use 3 JNCD for the threshold of a visually noticeable display color difference. The 1 JNCD and 3 JNCD sizes are shown in the Figures below. Any Display Color Error less than 3 JNCD on a display is not visually noticeable and appears perfectly accurate to the eye. 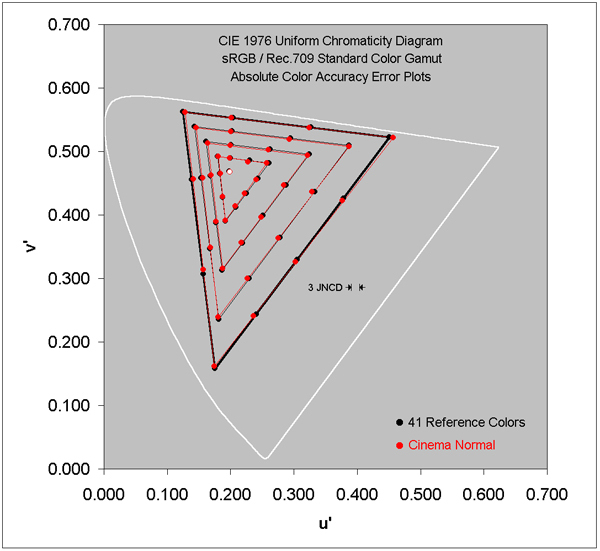 For an in-depth discussion and analysis of Absolute Color Accuracy see this article. The Cinema Normal Mode provides a very accurate color match to the sRGB / Rec.709 Color Gamut. The Cinema Wide Mode provides a very accurate match to the standard DCI-P3 Color Gamut.